I ran my first 5k this year! As I re-read that statement, I am amazed because at 47, I spent 46 and half years convinced that I would never be a runner. Since I was a kid in gym I hated running. In high-school my older brother, home from college, encouraged me to run with him, and after a week of cramps, side-stitches, and that horrible feeling of sucking wind, I gave up. Whenever I would hear of my friends running to get in shape for their weddings, or back in shape after their babies, I definitively knew that I was not a runner. Needless to say, it took a lot of inspiration, moral support, and coaching for me to finally change that! Inspiration: Early in 2014 I pulled a muscle in my shoulder and needed a different workout. The inspiration to take up a sport I never saw myself doing came at different times. First, I read an article about the benefits of women taking up running so I reviewed the article’s guidance for getting started but I didn’t like the routine they proposed and I tabled the thought. Next my former officemate, Gregg, shared his fiancé’s experience with her Couch-to-5K program. I thought Erin had been running for years but it turned out that she had only taken it up recently, so I found myself considering it once again. Next, I watched a wonderful news piece about 90-year-old WWII veteran, Ernie Andrus, who was running across the country to raise awareness about a war ship called the Landing Ship Tank. I kept thinking that if a 90-year-old man could run 5 miles a day every day, then there is no reason that I, who is almost half his age, couldn’t work up to running 3 miles every other day. I tracked down the Couch-to-5k app and began my journey in May. I downloaded a great playlist with songs that I love and want to hear. I live in an excellent town for running with a great path on historic Peebles Island, and I loved the early morning walks and runs on the wildlife-filled trail. I would often be treated to a beautiful sky line over the water as I hit my 2 mile point. Since I began running, I have encountered ducks, geese, hedgehogs, deer, dogs, even a skunk (who thankfully did not spray me), my neighbors, our mayor, a judge, and even an Assemblyman. All of these encounters helped to spur me on. Coaching: Gregg, my Marine officemate was a great coach. He assured me I could do it and, in typical Marine fashion, reminded me that “pain is weakness leaving the body”. He and Erin gave me helpful advice about my breathing and my pace. He provided guidance on running up and down hills, offered song suggestions, and patiently answered a lot of my questions. Moral Support: My other colleague, Holley, lent a great deal of moral support on our daily walks. I was particularly worried when the app called for me to transition from the 3 to 5 minute intervals to 2 to 15 minute intervals, but she assured me I could do it, so with that encouragement, Gregg’s expectations, and the thoughts of Mr. Andrus in my head, I kept with it. 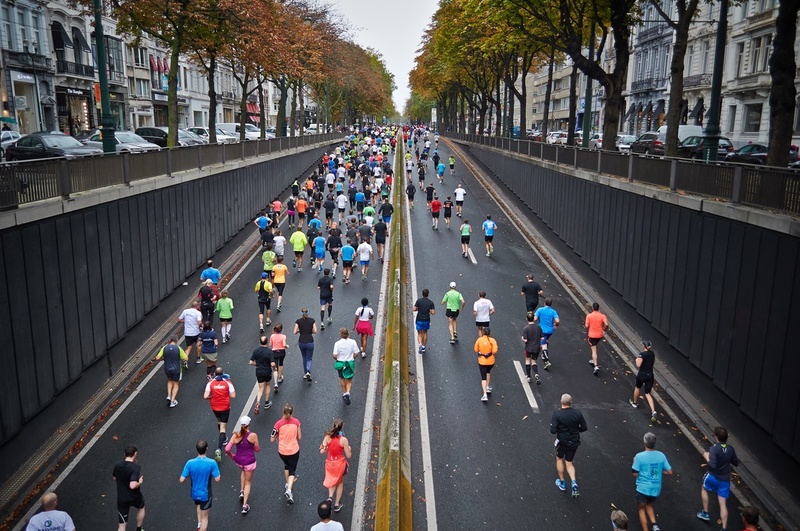 As my first 5k approached, my colleague Kay offered her own bit of much needed moral support – she helped me know what to expect at my first race as I worried about taking this running thing public. Now that I am running, I seem to be surrounded by a lovely community of runners (family, friends, and acquaintances) who are always happy to lend support and encouragement. 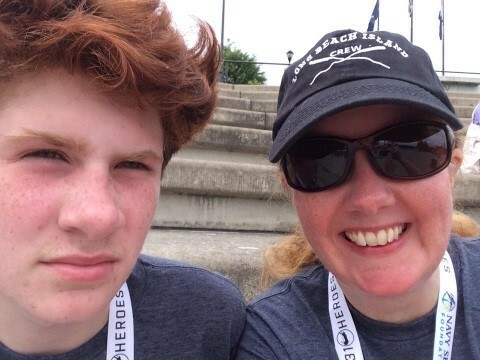 On Saturday August 23, my 15-year-old son, Nolan, and I ran the “Jogging for Frogmen” 5k in honor of two veterans in our family. My husband was there to cheer us on and, as I struggled through the third mile I knew I had to finish the race because I could not go back to work and tell Gregg, Holley, and Kay that I hadn’t finished. I also knew that if I didn’t finish, I might not do another 5k. I did finish and felt an amazing sense of accomplishment. At our next 5k in October, I knew how to pace myself and realized that I shouldn’t worry that everyone seemed to be running faster than me, and, I’m happy to say, it wasn’t a struggle to finish. The high point that day was when my son, who had finished ahead of me, paced with me as I neared the end and ran next to me as I hit the finish line! Nolan and I have now completed four 5ks and even ran in the Turkey Trot, a race my son has asked me to do with him for many years. This year I did – I am still amazed!